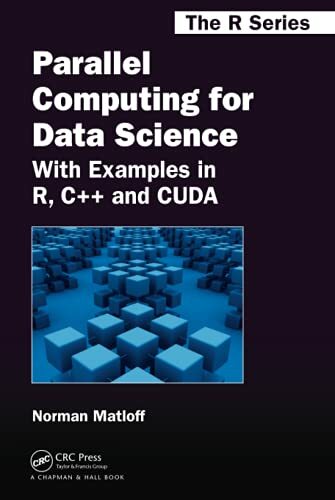 [PDF] Parallel Computing for Data Science: With Examples in R, C and CUDA | Free eBooks Download - EBOOKEE! Posted on 2017-11-21, by luongquocchinh. Description: Parallel Computing for Data Science: With Examples in R, C++ and CUDA is one of the first parallel computing books to concentrate exclusively on parallel data structures, algorithms, software tools, and applications in data science. It includes examples not only from the classic "n observations, p variables" matrix format but also from time series, network graph models, and numerous other structures common in data science. The examples illustrate the range of issues encountered in parallel programming. With the main focus on computation, the book shows how to compute on three types of platforms: multicore systems, clusters, and graphics processing units (GPUs). It also discusses software packages that span more than one type of hardware and can be used from more than one type of programming language. Readers will find that the foundation established in this book will generalize well to other languages, such as Python and Julia. 2019-02-17R Programming A-Z™ R For Data Science With Real Exercises! No comments for "[PDF] Parallel Computing for Data Science: With Examples in R, C and CUDA".